Delawareans are honoring the life of former State Senator Steven Amick, who passed away on Wednesday. Amick rose to the highest ranks of Delaware politics, beginning his political career as a State Representative in 1986. He was elected to the State Senate in 1994, where he served as Senate Minority Whip and Senate Minority Leader. Amick retired in 2008. A Republican, Amick served on the Judiciary Committee, the Substance Abuse Committee and the Joint Sunset Committee. 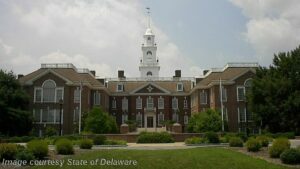 Delaware Governor John Carney has ordered flags across the state to be lowered to half staff from today until Monday. A celebration of Steve’s life will be held 4:00 – 6:00pm on Saturday February 2, 2019 at R. T. Foard and Jones Funeral Home, 122 West Main Street, Newark, DE. 19711. In lieu of flowers, memorial contributions may be made payable to “Washington College” and sent in care of the funeral home. To send condolences, visit www.rtfoard.com.